Our Gladiator Battle Dragon Twin Sword Set is an excellent replica set of weapons that Rome's skilled warriors carried into battle. The 18 1/2” stainless steel blades have a satin finish and the handles are of aluminum alloy. 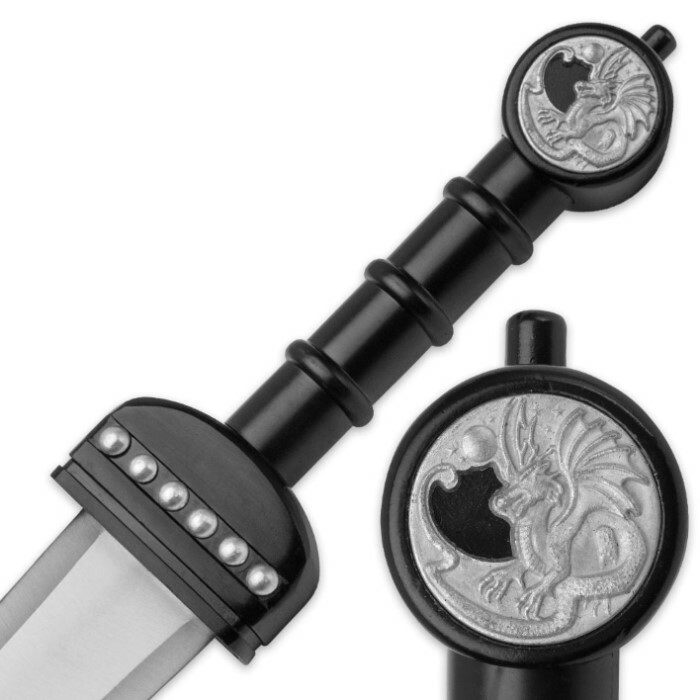 The black handles feature an intricate silver dragon emblem on their pommels and silver stud accents on their gladiator-style guards. 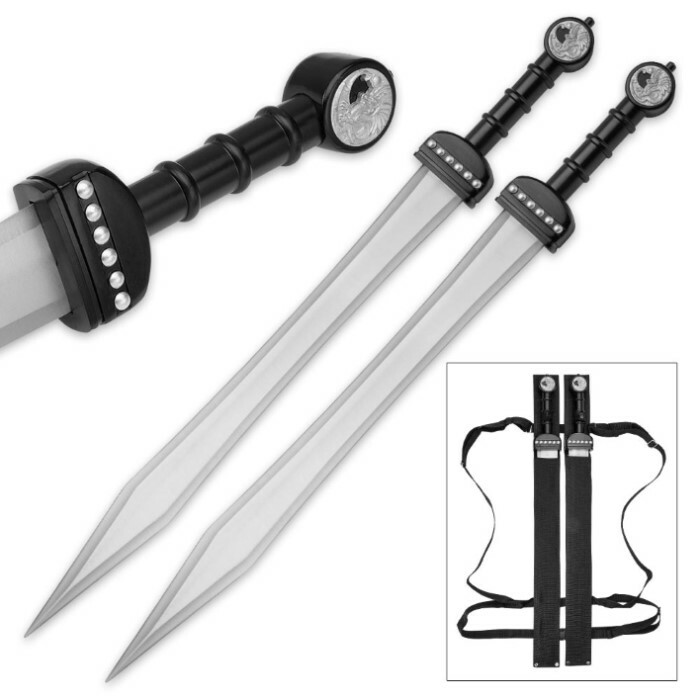 Each of the swords is a masterpiece reproduction that is suitable for reenactments, theatre productions or cosplay. 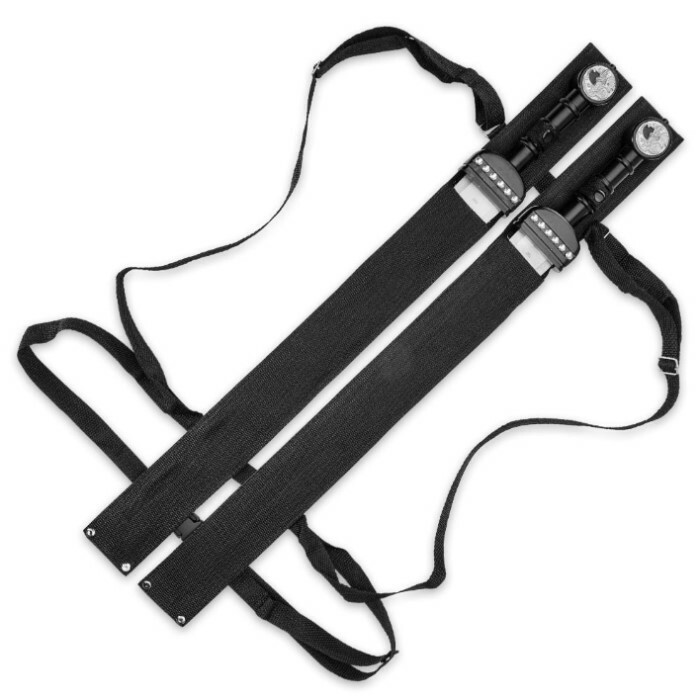 The twin set can be carried with ease in the sturdy nylon double sheath with its shoulder belt. The swords are pretty neat, but mine won't even go into the sheath. .. Part of the appeal was being able to wear them like a backpack, but that's not possible. The swords themselves are very good. They feel amazing when you hold them. My only problem is with how tight the sheaths are. They aren't made for the wider part of the blade towards the tip. If the sheaths were a little wider, the set would be a little better, but the swords themselves were definitely worth it. The swords are awesome but the sheaths are pretty much useless. I am not returning them cause they were only 16 dollars but I am really disappointed with the sheaths. These swords are awesome!! The sheath should have some kind of built in insert that allows the sword in and out easier without piercing the sheath. Over all I’d say awesome product as usual.